Those petty constraints of the time-space continuum hold no sway over the wondrous world of superhero comics, where tinkering with narrative history is common practice. If done with the proper level of forethought and care, “reboots” and “retcons” (“retroactive continuity”) are effective ways to freshen up sluggish franchises, sweep away creative missteps, or otherwise rekindle reader interest in a given property. Triumph (a.k.a. 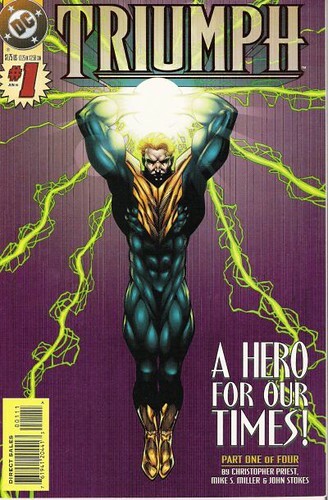 William MacIntyre) made his debut in Justice League America#92 (September 1994), as part of a story arc linked to the Nexus of Nobody’s Favorites otherwise known as the Zero Hour miniseries. Possessed of the vague, yet deus ex machina friendly power of “harnessing the electromagnetic spectrum,” Triumph was presented as a founding member of the original Justice League who had been obliterated from memory during the superteam’s first adventure. Though the underlying concept had a bit of potential, it was fatally and painfully undermined by Triumph’s inherent lameness and excessively Poochiesque presentation. As I’ve stated before, superhero fans can stomach — if not forgive — a lot of creative sins, but having a dude in a turquoise unitard and parts cribbed from a 1959 Cadillac upstage the likes of Superman and Batman reeked of desperation. After being cut from the team, Triumph reappeared as a villain during the “Crisis Times Five” arc of Grant Morrison’s JLArun, turning his vague energy powers and incessant whining against those who failed to give him the respect he deserved….only to be transformed into an ice sculpture in the process. There are many reasons why Triumph qualifies as Nobody’s Favorite — his stupid costume, his nonsensical powers, an origin as presumptuous as it is preposterous — but if I were forced to narrow it down to just one, it would be the fact that the character was awful enough to be booted out of Justice League Task Force.That’s the kind of indelible stain which even a multiversal linewide reboot could never erase. Alas, too true. 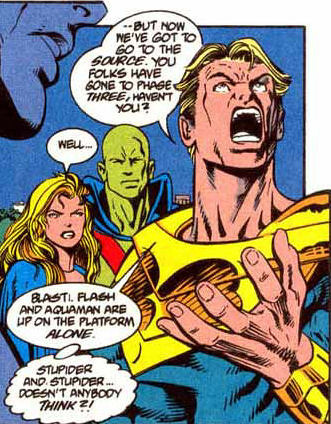 And I could say “See also: Sentry” to pretty much this entire entry. Even when I first read that Morrison JLA arc, when I’d never heard of Triumph before, I got the impression that Superman was trying desperately to keep a straight face in that last panel. Ugh, I remember Triumph all too well. Marvel did the concept much better with Sentry, though his incorporation in the rest of the MU was a bit rocky. i actually enjoyed JLTF quite a bit when Priest was writing it, but the themes did get repetitive. i can’t say Triumph is my favorite, but i did enjoy reading him. Hah. It’s a shame DC’s staff didn’t like him as much as they could’ve, I LOVED this guy. Still do. Even Marv Wolfman wanted to take a crack at writing a story related to him (Brave and the Bold 17-18). I always considered his story a huge tragedy of a character who just couldn’t get any love.